Dear brothers and sisters,The year 2008 has been announced to be the year of family-type children homes in Ukraine. 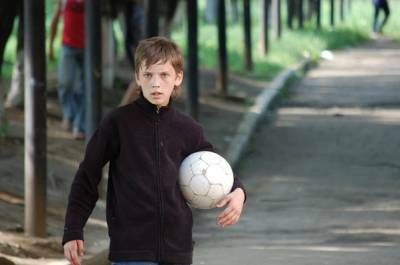 It is a well known fact that the situation with orphans and street children in Ukraine is catastrophic. The old teaching and rearing system employed in orphanages is not simply outdated and useless but even harmful and dangerous. For the past seven years the members of the “Let’s Love” foundation and the members of the churches of Christ in Ukraine and USA has been bringing the light of the Gospel into the darkness of the Donetsk and Donetsk region orphanages. We introduce Jesus to the children and build bridges of trust and friendship with them. To this present day our Foundation has been actively involved in the ministry with 6 (six) orphanages which are hosting 700 orphan children. As long as we live and as long as the fire of the Holy Spirit is burning within us we want to continue and grow the ministry with orphanages. Our team continually optimizes and adjusts its work to be more effective for the Kingdom of God. This year the “Let’s Love” Foundation in cooperation with the churches of Christ in Ukraine and USA is launching an International Benevolent Project called “Welcome Home”. · Rearing over 50 children in an old fashioned orphanage type environment is ineffective and even harmful for the children’s souls. · An orphan child needs individual approach, family atmosphere and a heartfelt treatment from adults. · A child needs spiritual mentorship and spiritual support. No family can be a blessed and prosperous place unless God is the head of it. · Many young Christian families willing to start a family home for orphans face financial and residential problems. · Making the National family-type children homes Project popular and widely spread among Christians.· Cooperation with Authorities concerning the rights, State guarantees and responsibilities of family-type children homes. · Spiritual, financial and educational support of families willing to start a family-type children home.· Purchasing a building for a family-type children home. · Electing a board of trustees and sponsors including the leaders of the project and sponsors from Ukraine and USA and families willing to start a family-type children home. · Purchasing, finishing the legal paper work and remodeling a building (Kirovsky region church of Christ building as a prospect building). · Placing a family and creating the first family –type children home. · Placing a family and creating the first Transitional Living Center for the orphanage graduates while they study in college. A child is a subject of a great interest of the evil one through the drug dealers, gangs, souteneurs and apartment mafia. Bless an orphan with a family! Help Jesus come to his aid. Orphans need “Welcome Home”!